Next weekend I am going to look at a C&P OS 8x12. I have been doing research online so that I can determine what I should offer for the press. I have a general question about the press. It seems complete, but when you look at the right side of the press (not the flywheel side), there is a long shaft sticking out of the side. In some of the C&Ps I have seen, there is a wheel mounted on this shaft, but in others, it is not present. According to the C&P New style manual on Boxcar’s site, it’s the “tight pulley” and “loose pulley.” In one video I watched online, a belt was warped around this pulley to drive the press with a motor. What is the purpose of these pulleys? Are they only there to drive the press with a motor or do they serve another purpose? Are they only present on the New Style presses, or should my Old Style have them too? If they are supposed to be there, can I still operate the press without them? I’m planning on using the foot treadle to operate the press and I’ve seen a lot of presses online that don’t have these wheels, so I’m assuming it’s okay. I just don’t want to get a press I can’t use. 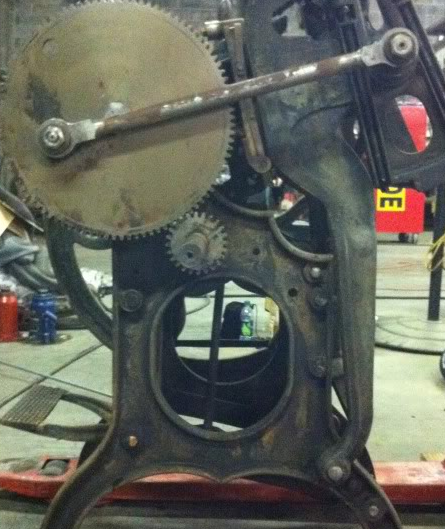 I’ve attached a picture of the side of the press so you can see the shaft. oops! Photo file names do not like non-letter -number characters. Please try reposting without the ampersand :D Thanks! Let’s get a look at this contraption! The drive pulley is only used to power the press with a drive belt - from a motor or overhead pulley system. You see them on OS and NS presses, which can run just fine without them, as long as you have a treadle. Some people run a belt around the flywheel for the same purpose. Thanks Bill, that’s what I suspected. I uploaded the picture again for carriev. Could use some elbow grease to clean it up, but perfectly normal otherwise. Just watch out for running into the shaft when you’re walking around the press - it’s kind of out there. As BillWhitley says, the drive pulleys are not needed. My own 8x12 OS no longer has them and some previous owner (likely the school system I’m told had owned it at one time) had shortened the shaft on that end to keep people from banging their shins on it. If you don’t do the same, you might want to position the press to minimize the possibility of sore shins. Or put something soft on it to pad the inevitable. Please don’t shorten the shaft! Someone may want to motorize it some day. Put a bright yellow tennis ball over the end of the shaft (for visibility). you will be just fine with this setup as said above, don’t cut it off. if you ever want to motorize it you will need it.